In December 2013, Simon from For Jimmy came into my restaurant to explain what the Safe Haven scheme was all about and how we could get involved. We represent the community in a sense, and being a member of that community, it seemed quite an obvious thing for us to take part in. Prevention is better than cure, so if we can have more facilities for young people, then they will know where to go when they feel insecure on the streets. It’s also a good way to help tackle bullying, not just in school but on the streets. Luckily, touch wood, we’ve not actually had any incidents yet. I have two young children so their safety is a concern of mine. The world is a small place, even though it appears to be big, so we need to work more closely as a family. This scheme is spreading the values of family and looking after each other, which is something we want to see in our community to make it safe. You don’t just learn in school, you’re moulded into becoming good citizens based on the community that you’re in and the atmosphere in that community. I still think there is more to be done, but it’s best to start somewhere rather than nowhere. In 2014 For Jimmy facilitated a Community Partnership to launch the Deptford Safe Haven Pilot. (For Jimmy, Lewisham Business Against Crime (LBBAC), Lewisham Council, Lewisham Young Mayor Team, Lewisham Police, Second Wave, every Lewisham Secondary School and a number of other local community and faith groups). A Safe Haven is a place where people work in partnership to report and discourage crime and anti-social behaviour and to offer temporary shelter to young people in immediate danger. 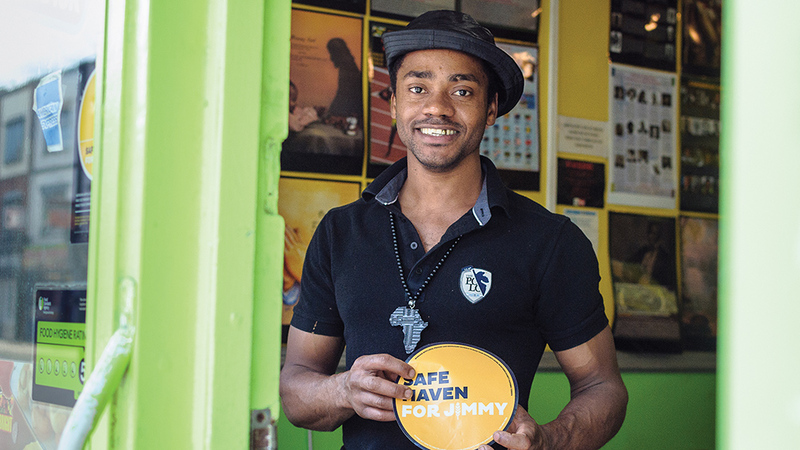 We’ve already launched Safe Havens For Jimmy throughout Lewisham Borough. It’s our volunteers and donors that make this possible. Please support us so we can continue to make our communities safer.